Monroe County school Superintendent Anthony Pack is gay and in most parts of the country no one would care one way or the other. It is an inconsequential to his ability to perform his duties as the superintendent as the color of his skin or hair. But apparently in Monroe County, Georgia it appears to matter to the local newspaper publisher. This all came to light from a “journalist” and I use that term loosely and very reluctantly named Will Davis. Davis is the editor and publisher of the Monroe County Reporter. I had never heard of this newspaper before today. When I found the site I was reminded of websites from the early 90’s based on the design and layout. I found his twitter account as well which includes some ultraconservative right wing tweets so it not surprising that Mr. Davis seems to be so offended by the fact that the superintendent is gay based on the tweets I read. Apparently being gay passes for headline news in Forsyth, GA. It appears the Monroe County Sheriff’s office decided to confiscate the superintendent’s work computer, his phone, and his tablet. 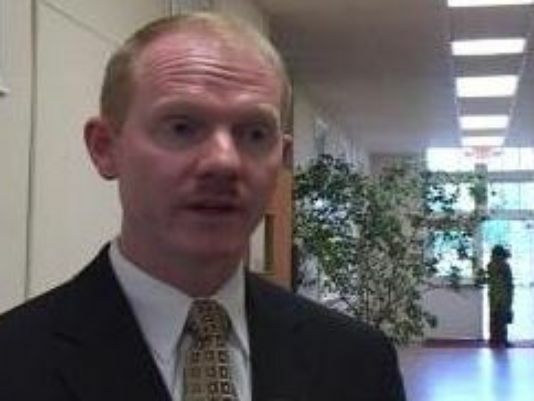 The reason they gave was the board of education had received allegations that Pack had participated in “an online site geared toward male relationships.” The sheriff said Monroe County School Board Chairman, J. Ray Grant, called him to request the investigation apparently after being tipped off from Will Davis. My questions is “so what”? The allegations that his computer was hacked is no more than a pretext to invade his privacy and snoop. Make no mistake this is a homophobic witch-hunt based on bigotry and nothing more. Online dating by both heterosexuals and gay people today is widely used. On mobile devices one app in particular called Tinder is extremely widely known and very popular. You can view photos of people according to a search criteria and you swipe left or right if you are interested. If there is a match you can then chat and possibly decide to meet in person. The gay equivalent of Tinder is called Grindr. This is the app apparently at issue. Someone sent photos to local media in Macon last week of Anthony Pack from this app presumably to “out” or embarrass the superintendent. One has to wonder if this intrepid reporter would have bothered to do the same had this been a heterosexual dating app. I would bet my life that a good many other Monroe County officials have accounts at all sorts of sites they would prefer not make the news. As much as some people might want to look down on online dating and think the only appropriate way to meet someone is at a church social or the library…. that is completely unrealistic and anachronistic. Dating or meeting people in 2015 is almost exclusively done online nowadays. Even Facebook and Twitter are frequently used for hookups . There are dating sites for every genre imaginable. Whether you are Jewish, Mormon, Atheist, Korean, or an athlete …I can almost promise you there is a site out there tailored for you no matter what you are seeking. So why is it wrong for a gay man to use a gay site for companionship or friendship? It is not like there are gay restaurants, gay social clubs, gay supermarkets, or any other places these prudes might deem socially acceptable for the superintendent to meet another man. Their hostility is not the app or any website. No, their concerns have to do with the fact that he is gay and that alone. But they can’t come out and admit that so they came out with an excuse they felt his computer had been hacked in order to invade his privacy. I would love to see the look on the faces of other Monroe County public officials like the Sheriff or BOE chairman if their phones were confiscated and their privacy was invaded based off the tip of a homophobic pseudo-journalist or anyone else. In fact I would love to look through the phone and computer of Mr. Davis and see what embarrassing things I could find. But unlike Mr. Davis I am not concerned what he does in the privacy of his home or who he chooses to sleep with. It is none of my business.What a shame that he decided to run with this story instead of telling the anonymous tipster he doesn’t print idle gossip. It is important to keep in mind that Superintendent Pack has not been accused of any crime. He has done nothing wrong other than being gay and apparently choosing to use apps and website hundreds of millions of other Americans use daily. By all accounts he has done a good job as superintendent. This level of intolerance and sleazy journalism by the publisher of the Monroe county newspaper is an embarrassment both to that organization and Monroe County as a whole. Although Mr. Pack may find this to be a difficult time I hope this turns out to be a good thing in the long run. He will no longer be at the mercy of unscrupulous individuals that might try to blackmail him for being in the closet. The truth will set you free after all even if it may look bleak at the moment. Now that the fact that he is gay is out there, he will feel a huge weight has been lifted from his shoulders. It is unfortunate that in 2015 so many people in Georgia still feel the need to live in the closet because of so much pervasive homophobia from the likes of Will Davis and others who think being gay is in any way pertinent or news worthy. Gay teen depression and suicide is also far higher in the Bible Belt thanks to so much homophobia. Maybe Mr. Pack can now be a role model to gay teens who needed someone to tell them their lives matter too. No one should be embarrassed, ashamed, or bullied for simply being born a certain way. I am quite confident that Mr. Pack didn’t suddenly realize he is gay. He has almost certainly been gay from a very early age but due to pressures or fear chose to live a lie until now as many others do in the south. They choose a life of lies and denial because they feel that is easier than being true to themselves. They fear the repercussions of losing friends, family, and even their job if people knew they were gay. In almost every case it is easier to be true to yourself than to live a lie as someone you are not. Now that the truth has finally come out this will probably make him a far better superintendent. After gay people were allowed to serve openly in the military the morale and productivity of gay soldiers has jumped dramatically. What two consenting adults choose to do in their private lives should not be the concern of anyone else if they are breaking no laws. Whether he was looking for friendship, companionship, or even just a fling that is no one’s business but his. One also has to wonder why Will Davis was looking around Grindr…. If they want to say that using a dating app is incompatible with being a teacher they would likely need to fire around 95% of all single teachers if not 100% and likely a lot of married ones as well. All government and private employees uses their work phones for some private non-work related communication. That is a fact beyond dispute. Be careful of opening a Pandora’s box Monroe county, because I am sure there are many other skeletons that could surface if you pursue this homophobic witch-hunt any further. Just ask Justine Sacco whose life was ruined by one careless tweet. Dig deep enough on anyones phone or social media account and an army of skeletons is lurking for someone to find. Let people live in peace and respect their privacy. This is a perfect example of why the Religious Hate bill must be defeated because it would only empower homophobes like these to treat people differently and claim they are protected by religious beliefs. Unless he was breaking the law this matter should have been settled quietly between the superintendent and the BOE behind closed doors. Bringing the sheriff’s department and choosing to publish this in the local paper is an act of cowardice and vindictiveness. A video report by local TV Station WMAZ can be viewed at this link. Mr. Pack’s attorney released a statement that I am including below. Given all that various groups of people (races, gender, sexual orientation, etc.) have been subjected to in past and even present years, one would think in today’s society those who bully individuals or various subgroups within our culture would show kindness and understanding to those who are different from us individually. In the last four months my wife and I have been separated and quietly seeking an uncontested divorce. Regardless of my sexual orientation, the personal life of each member of my family has become a discussion point for many in the form of gossip. I have been forced by a journalist that prefers to report on gossip as opposed to news to reveal some facts about myself that I otherwise would hold privately between me, my wife, and my children. Deep personal contemplation, prayer, and a desire to see my spouse as happy as she can be in her personal life, led me to realize that I am gay. I have tried to privately cope with accepting my sexual orientation as not definitive of my identity, but rather a small part of who I am as a father, a person, and a public figure. My identity, as I define it, is that of a dedicated father and passionate school administrator. As a dad, I love my two boys and desire nothing but what is best for them even though we have encountered this most difficult time in our lives. As a Superintendent, I have had the joy of overseeing Monroe County Schools for the past seven (7) years. Historical times have occurred during my tenure. Our District’s Vision, “Committed to Excellence” is something I hold true to my heart and the administration of an effective educational system that focuses on the student, as opposed to arbitrary metrics, is the reason why our graduation rates are better, our costs are down while our fund balance is at its highest, and our students are better prepared for the modern challenges of today’s workforce. I have continued and enhanced the level of transparency of the administration of Monroe County Schools by implementing “Monroe County Schools By the Numbers” so taxpayers know where their dollars are spent and how it is helping the students of Monroe County. It is with that same dedication to transparency that I reveal these private facts about myself, because otherwise the Monroe County Reporter’s innuendos and egregious misrepresentations of myself and the facts at hand would continue to fester and create questions for our citizens and students. The School Board received information from an anonymous person last week regarding my participation in an online dating site geared towards male relationships. In order to ensure that I am not wasting the taxpayer’s resources or violating policies that we hold administrators, teachers, and students to alike, my publicly-issued work computer, phone, and tablet are currently being reviewed by the Monroe County Sheriff’s Department. I have fully complied with the Board’s requests that these pieces of technology be thoroughly analyzed, and look forward to a report from the Sheriff’s Department that my private life is indeed my private life, and not a public spectacle nor an abuse of public equipment or services. Just as no man should be judged by the color of his skin, no man should be judged by his sexual orientation, and I hope that this statement serves well to dispel the misrepresentations of my personal character which are flying about the local media. While I am currently on medical leave, dealing with another personal issue that needn’t be reported on or discussed further, I look forward to returning to work when I am well, and serving Monroe County with the same passion and vigor that I have for the past seven years. I hope that Forsyth can accept Mr. Pack for who he is and understand that who he is personally has nothing to do with his personal life. Many of the alumni from Mary Persons High School who have come out after going away to college cannot ever go back to that town because of how closed-minded people are. I am glad that Mr. Pack is able to be true to himself and maybe set a new trend for Forsyth, Georgia. I know J. Ray Grant and his sister, and I knew their mother. I ran into his sister in a local store a couple months ago. She doesn’t suffer fools lightly. I don’t think Dr. Grant cares if Mr. Pack is gay. I also know Sheriff Bittick. I taught his kids when they were in high school. I doubt whether Mr. Pack’s sexual orientation is a major issue for him, either. The pressure in this matter is coming from Will Davis and his supporters. This is a witch hunt, and the others are being goaded into taking part in it, and they will comply because that is the way things are done in Monroe County. The Monroe County Sheriff’s Office has a duty to investigate allegations of criminal activity. As the Sheriff stated to the media, Mr. Pack’s computer and other electronic devices are being reviewed by computer forensic experts to determine whether or not a crime has been committed. This is being done at the request of the Monroe County Board of Education, who along with Will Davis and WMAZ, received the e-mail from an “anonymous” source. When the Board of Education received the e-mail, they contacted the Sheriff’s Office and requested the investigation. Mr. Pack is cooperating with the investigation and readily supplied his electronic devices for forensic review. The Board of Education’s electronic devices used by Mr. Pack were not confiscated, but were supplied to the Sheriff’s Office along with a written consent to search. In the course of the investigation, if it comes to light that someone –anyone — violated the law, that person or persons may be prosecuted for the crime(s). And to know whether or not a criminal act has occurred, an investigation must be conducted. First of all that is ludicrous. All anyone would need to do is get a photo of a person from Facebook, twitter, or anywhere else. They then create an account on Grindr and assume the identity of that person. There is no hacking involved. Fake profiles occur all the time with celebrities especially on Twitter. That is why Twitter started using the blue checkmarks to identify the real celebrities. Secondly, iOS nor Grindr are hackable. Too long and complicated to explain here but trust an uber nerd like me. Is it possible he gave someone his password or they guessed it? Yes, but that would only allow them access to that one app and nothing else. Finally, even if there was the tiniest possibility that his phone had been hacked the Sheriff’s department do not have the expertise to determine that on an iOS device. Also, why would they also check his computer? This app is for iOS only not for OS X or Windows which a computer uses? No, this was simply a pretty obvious excuse to snoop. told the Reporter. Would certainly leave one to believe that Mr. Pack had thought himself that the devices were hacked, I, personally feel this way about the situation; Is Mr. Pack’s private life our business? No. If Mr. Pack visited these sites while on County paid time and on County provided devices makes it our business? Yes. I fully support Mr. Pack in his personal life decisions and pray, yes I said the word “pray” that he finds happiness in his own life and with a life partner that he can fully share life with. However, If Mr. Pack violated any county or BOE policies, his actions must be dealt with accordingly. Not because he is gay, but because he is an employee of the county. Before my grammar is corrected by some Monroe County’s finest educated Facebook trolls, my statement should have read “leads” and not “leave”. I could find a photo of you and create a profile on Grindr. That is not hacking!